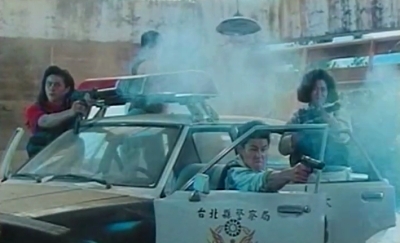 It may not have set the Hong Kong cinema action world on fire but 1988's The Inspector Wears Skirts had its share of name talent and Jackie Chan production and action-team skills attached to it. 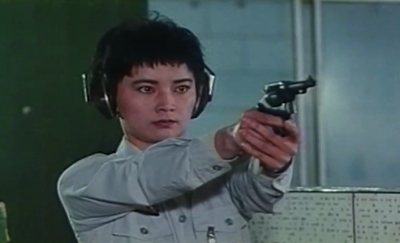 Somewhat of a ripple could therefore be felt in this Taiwanese production (that also boosts the casting of Sibelle Hu from said 1988 movie) but with a more violent, albeit low budget, edge to it it manages to be less unconnected skits plus shoehorned in action that even subsequent efforts in the Skirts-series ended up being. 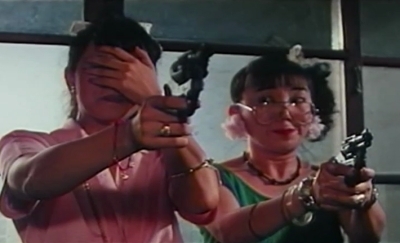 Having said that, Lee Tso-Nam's movie merely has a loose framework of a group of female police assigned to the Female Criminal Squad for training, some shenanigans and the looming threat of robbers with a personal connection to the squad. Types are established, including kind, shy, boy-ish and comedically obnoxious (have fun getting used to the chipmunk Mandarin dubbing of the character of Yang) and although some goodwill is established in an intro scene where Alexander Lo Rei's co-choreographed action make the girls look fairly powerful, we are soon led into the bulk of the movie set at the training grounds. Where the girls will feel contempt towards authority, towards fellow students but become super friends, co-operative and skilled eventually. No particular chemistry or strong banter carries these threads into any kind of memorable territory but despite a 100 minute running time and a middling grade looming, Emergency Police Lady does seem to be on the move at least. In particular because it has ever so slightly more story-focus than expected. The girls complete training fairly early on and Lee Tso-Nam and crew are not afraid to start punishing us and stuntmen from this point on. Gunplay isn't stylized but Lo Rei stages matters in a snappy, powerful and gory way. The stuntmen or women earn their pay via a couple of nasty falls and while the personal drama isn't affecting, that this dopey time decided to be a deadly time makes for a mildly watchable trek through almost rip-off cinema.